Curtain Call by Anthony Quinn (no, not that Anthony Quinn) has widely been billed as a murder mystery, in which a serial murderer known as the Tie-Pin Killer stalks the streets of 1930s London. However, if you actually pick up this book looking for detective fiction you will probably be disappointed, as while it's the actions of the killer that tie the main characters together through a series of meetings, coincidences and misunderstandings, the mystery element of the plot occupies by far the fewest pages of the interlocking story arcs and is subject to almost no analysis whatsoever. There is no detective work involved and no exploration of motive; in fact, you are unlikely to give a toss who the murderer is at all. For me, though, this didn't matter in the slightest. I enjoyed this book so much and became so invested in its characters and their relationships that I was perfectly happy for the murder plot to - as, I suspect, was the author's intention - play second fiddle. The main characters in Curtain Call are a joy. Actress Nina Land is a modern, independent woman, but fears for her future as both her career and her small inheritance appear to be dwindling. Stephen Wyley, a renowned society portrait painter, is fast falling in love with her but is painfully aware that by doing so he is betraying his blameless wife and children. There's also larger-than-life theatre critic Jimmy Erskine, a monstrously conceited coward who is, at the same time, somehow saved by Quinn's skill from being completely insufferable. Like all the characters, Jimmy has something to hide: he's gay at a time when this could not only end his career but put him in prison. His long-suffering secretary Tom Tunner, despite being straight, is trapped in an amusingly marriage-like relationship with Jimmy, while at the same time concealing from him that he suffers from epilepsy. Finally, there's the fabulously named Madeleine Farewell, a kind, sensitive middle-class girl whose apparent impoverished gentility becomes a cover for her profession, which as you can probably guess, is the one commonly known as the oldest. Each of them has a multitude of faults, yet you can't help thinking you'd happily sit down to dinner with any one of them, and Jimmy - the most flawed of them all - is possibly the most entertaining of the lot. There is a sense of genuine tragedy about Nina and Stephen, and the relationship between Madeleine and Tom is utterly charming from the very moment they meet. Moreover, in the huge cast of supporting characters, there isn't a single one I couldn't immediately believe in; Quinn really does create portraits with words with all the skill of Stephen's paintbrush. Nina's theatrical dresser Dolly, Stephen's daughter Freya, Madeleine's pimp Roddy, Jimmy's Hungarian Jewish friend Laszlo - every one of them is as memorable as the major players. Equally vivid is the setting. The London of the 1930s, with its theatres, nightclubs, semi-respectable boarding houses and Lyons Corner House cafes, is almost a character in itself. The clandestine gay scene, and the appalling injustice of the anti-gay laws of the time, are brilliantly evoked. The looming threat of World War II is already present - Madeleine's strange dream about a London ravaged by fire and its houses turned to matchsticks is surely no coincidence - and there's home-grown fascism to contend with too, including a guest appearance from William Joyce, latterly better known as Lord Haw-Haw. The style of Quinn's prose is perfectly suited to the period setting. It's witty, occasionally brittle, and never overblown; precise, yet stylish - the dialogue, in particular, is close to perfect. There are aspects of a comedy of manners in the language at times, and yet also of Brief Encounter, and of Golden Age detective fiction, and, fittingly for a book that seems to cross genre boundaries, all the elements combine into a deeply satisfying whole. 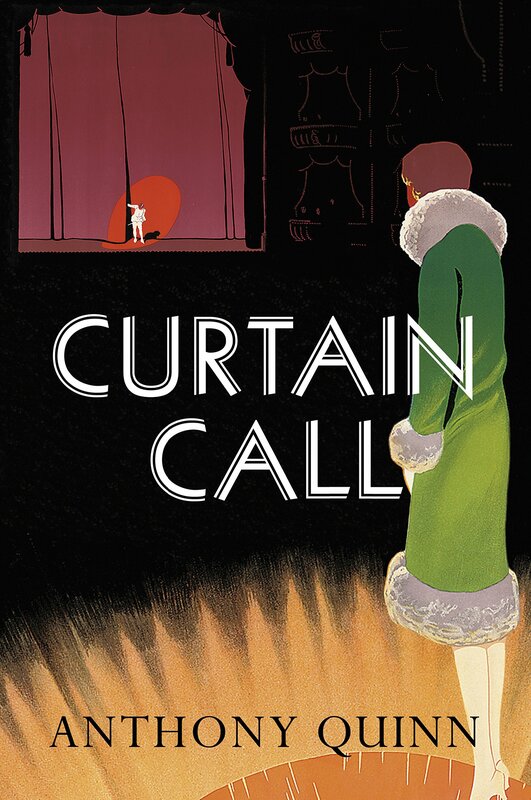 Thank *you* for such a great read - Curtain Call was one of my absolute favourite reads last year. I really like the sound of Freya so I'll definitely be reading it soon.